I had a lunch meeting to transfer information for my JLA committee next year on Thursday. It was gorgeous outside so we sat on the patio. For two hours. It was lovely with a cool breeze. I wore the long Lilly that I purchased from RueLaLa. And then I drove home. Started to itch. Only to realize that I would soon turn tomato red. Not only am I burned to a crisp, but it is a funky burn too. Like one shoulder is terrible (pictured) and the other is bad and my back is bad and my chest (thank goodness I wear sunscreen on my face daily!) has a little color. But when I am wearing anything other than that dress, it looks so strange. I just didn't realize we would sit outside so I didn't think to lather up with SPF 50 like I usually do in such situations. "Ouch" is all I have to say!! Lesson learned. New bottle of body sunscreen shall be purchased this weekend. Oh dear! I do hope you are okay! not fun. hope it's healed soon. ick. I am an old pro here - dunk a few tea bags in hot water as if to make tea. Toss them in the fridge for a bit to cool 'em down - then pat all over the burn. The tannin in the tea brings the swelling down and eliminates the burning feeling immediately. Blows aloe out of the water. I have really fair Irish/Swedish skin with freckles and use sunscreen year round now. But, not unusual for me to get burned going across the parking lot to the market. I feel so bad for you! Take care. Oh no!!! You poor, poor thing! Ouch!! I feel your pain, I went to the beach last weekend and obviously didn't put on enough sun screen - I am peeling now - no fun! :( aloe vera gel and ib profin- a sunburn is just an inflamation of the skin and ib prof is anti inflammatory- an old trick from my lifeguarding days! Sunburns are no fun. I am experiencing the same thing right now after a day out in the sun yesterday! Oh no! I say grab a bottle of aloe and a cold drink and relax. Hope it gets better soon. That is a big ouch! Hope the pain goes away soon! Oh no! Ouch! I did this once too, and I never did it again! Too painful! Ouch!!! Lather up the aloe...hope you feel better soon! Not fun, bring on the aloe! Ouch--looks painful! Hope the burn goes away soon! Oh no, go get some aloe my dear! You do not want to end up with peeling like me, no fun! Ouch!!! My suggestion is Aloe Vera, but I'm intrigued by the tea idea. Hope it feels better soon.. I will never ever go without sunscreen ever ever again! I promise!!! 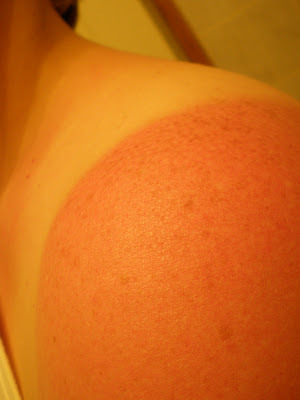 Ouch, I hate sunburns. By the way, I am thinking of joining JLA for the fall... what do you think? Do you like the organization here?